First, you need to purchase the tiles at your local Hardware store. I use Tumbler tiles. These are approx. 6x6 in size. Love this size. They cannot be a slick surface. These tiles once finished will be used more for decorative purposes and not a coaster. Pick your stamp set and then use CRAFT ink to stamp. Once you have stamped, use Glassy Glaze over the tile. Tap off excess. Pop in the oven at 350 degrees for 10 min and BAM they are done. Let them cool and then add some fun accessories to them for added fun. These are TERRIFIC for gifts and beautiful in your home. If you have any questions, just email me directly. :) I hope this helps! That is what I feel like these days. I have been one happy stamper! Just stamping away in my room. I just have a quick minute to post, but thought I would share a little project with you. I have been working on some new tile samples for an upcoming class. This is my favorite one! I love the Fabulous Flowers stamp set. I used the new ribbon from the Holiday mini and it just screams beautiful. What a fun gift to give a friend. 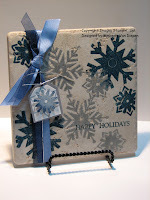 The Snowflake Tile I used our Encore pads and Night of Navy. This would also make a great gift during the holidays. These are so much fun to make and always make you go WOW after you see them complete. Have a GREAT day tomorrow and thanks for stoppin' by!! Time for a scrapbooking page. I taught a class today and thought I would share the layout. This class is a series of classes that I teach each month. 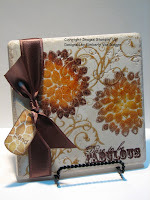 It is the basics of scrapbooking and todays class focused on patterned paper. I love patterned paper and I love how Stampin' Up! 's paper coordinates together nicely. Really there is no thinking involved, you just get it out and play. Very fun. 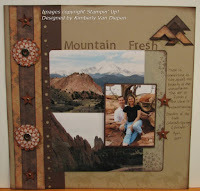 This layout uses the Outlaw designer paper and textured cardstock. Wow do I love that paper. I made mountains out of the photo corner punch in the right hand corner. Worked perfectly. You will notice that I stamped on transperancy with the big round stamp in the Wanted set with White stazon and then punched out using my scallop punch. I then punched another scallop in Really Rust and mounted the transperancy onto that and used one of our REALLY cool big eyelets for the center. Lots of fun things on this page and I hope you enjoy! Chipboard is one product I can't get enough of!!! I love the way you can use it on ANYTHING. 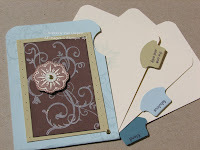 This is a card I made using the chipboard from the On Board Blossoms kit. 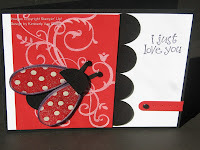 Everyone loves making the ladybug with the Pick a Petal set, so why not add it on the chipboard. I also used another fun set, Baroque Motifs to add a little swirly behind the ladybug. Just too stinkin' cute. We made this card at my Chipboard class last month. Boy did we have fun and hope you enjoy!! I'm alive, and well and stamping like a mad woman. I am unable to share at this time only because my photo editing software hasn't been loaded on my new COMPUTER!!!!!!!!!!!! Whooooooooooooooooooooooo Hoooooooooooooooooo!!!! I am so excited. Russ got sick of me taking up his laptop all the time, so now I have my own. This really rocks my world. 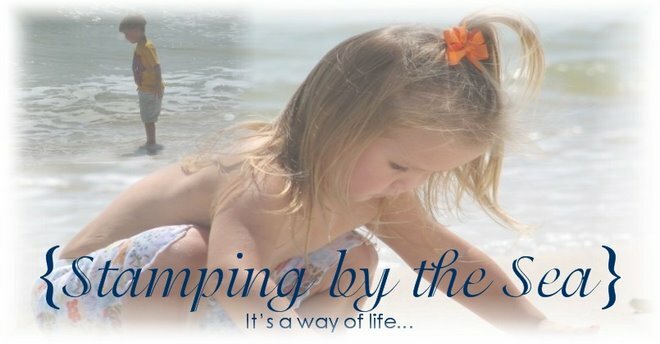 :) I hope to be able to start loading lots of fun cute things by the end of the week. In the meantime, I am steadly working on classes for the next couple of months and enjoying it. My Fall line up looks to be a lot of fun. I hope each of you are doing well, and hang tight... I will show something fun soon. Since I have been back from convention I have been crazy busy with all kinds of projects and classes in the works. I have so many ideas swirling in my head. Ahhhhh! Here are a few things I thought I would share. The first project was my convention swap. The original card fold idea came from Heather Summers. I love the colors on this swap. Love how sky blue goes with chocol ate chip. Just yummy. Then throw in a little river rock, and it really rocks my world! The next project uses our new designer paper which I just LOVE. Our paper is just so yummy. This is a little notebook that I made using my new bind it all. LOVE that thing. I've had it for two weeks and just now had a moment to play with it. This particular one was made for one of my downline. I love to shower them with stuff. They do a GREAT job and deserve it all. I used the Ginormous Flowers set. Oh my gosh what a GREAT set. I used the scallop punch in between the bottom flower and the top. Really fun. Love that groovy ribbon too. The last card just sums it all up. DREAM BIG! I had to have this set. It will fit perfect on many cards I will be sending very soon. I love that our convention theme was DREAM BIG and now I have a stamp that fits it as well. This cards uses all my favorite things. Love the colors of Blue Bayou, Sky Blue, and Kraft. I also love that beautiful kraft ribbon too. I also used my crop a dile to dry emboss. Oh what a lovely technique. I also used that beautiful Brocade Basics stamp set. Isn't that elegant looking. Love it. I hope you have enjoyed. This is a little of what I have been up to. Time to get back to my stamps. They are awaiting the next project. Oh my, where do I even start? I honestly do not think I have ever laughed so hard in all my life. I had the time of my life. Each convention gets better and better. Each year as I prepare to go I always think how they could possibly show me anything new. And each year I sit in my seat with my JAW dropped. This year was no different. I think the convention samples this year were outstanding. So what was the best part? As you know I love this company so much, it's because of the many friendships I have made along the way. It really is like a reunion. I loved seeing all my girlfriends and spending GREAT quality time with them. We laughed until tears strolled down our faces. We stamped! We had serious chit chats and we had silly chats. All in all, it was so great to be together. I loved watching my downline sit in awe over convention. 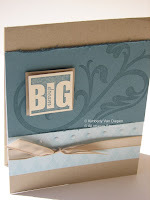 I love to see other demos catch the vision and big picture of Stampin' Up! It just makes me smile! So just what did make us laugh so hard? Here are a few highlights! *Watching 5 girls figure out how to get out of a parking garage that has a stuck car top carrier on top of the van in the garage! In our pajamas none the less. Traffic backed up and a "he/she" that was totally ticked at me! *Watching a guy run into a pole on his bike after checking out 5 girls in PJ's! *Watching Lisa try to figure out how to bake cookies in our room without an oven! PRICELESS! *Hearing that Vali did a face plant on the sidewalk when it was raining but still managed to keep the umbrella in the up position, meanwhile Kim is running with her ears plugged as she dodges the thunder and lightening. I believe Vali said she ran like a "psycho woman!" *Denise quote: "Man, I lost my glasses!" Kimberly: "Are they the ones that are on top of your head?" *Sitting at lunch..."What in God's name is this stuff they call LUNCH?" *Kim and Vali lost trying to find the van to put more money in the meter. Again, walking in our pj's. *Laughing so hard in class we almost got in trouble. *Awards night watching three of my friends get #4, 30, and #71 for Top Demonstrators. I screamed so hard my throat hurt. I am so proud of them. Lastly, saying goodbye to all my girlfriends just plain and simple SUCKED! I also had to say goodbye to my local girlfriend as she was moving as well. The positive side, I will see them in 6 months at Leadership! I am already counting down the days! I can't wait! So, if you did not attend convention... I highly recommend you start a convention fund. I strongly recommend you go. Not only do you learn GREAT things but you could possibly meet your best friend there. It truly was a fabulous time! I do have creative stuff to share, although my computer is not being photo friendly. I will try again tomorrow to upload some fun pics at convention as well as a few projects.